When the kitchen is down at a Steakhouse it means lost revenue and potential customers are going to another restaurant. This was the case at Mastros last year. Due to stoppages in the floor drains the hot-line was not running which brought the work in the kitchen to a halt. Fortunately, they called Popular Plumbing who quickly responded with all the tools and knowledge to fix the clogged drains. Utilizing electric drain cleaners and a video camera locator, the location of the stoppage was found outside of the restaurant in the building piping. It was so big that a section of pipe had to be removed to get rid of the stoppage. Just to make be on the safe side, the drains were further cleaned with a high pressure water jetter to ensure proper operation. 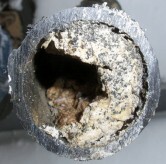 With speed and efficiency Popular Plumbing diagnosed and fixed the problem. In less than a day, the kitchen was operational again the restaurant was turning tables.